Hey folks, it's been a while. 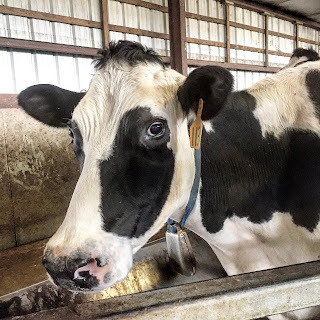 Let me catch you up to speed on what's been happening on Gilmer Dairy Farm recently. We currently have 223 cows in our active milking herd, which looks like our "high water mark" for this year. We will be sending several cows to the stockyard over the next couple of weeks, and I anticipate a herd size of around 210 after the next round of dryoffs, calvings, and cullings. Our daily herd production topped out at roughly 13,750 pounds of milk a couple of weeks ago, but our average per cow should improve by two or three pounds in the coming days for a couple of reasons. First, simply removing a few lower producing cows will boost the average. Secondly, we expect to see a production increase when we begin incorporating corn silage into their ration once again. We had an incredible drought this past year, one that lasted well into late Fall. As a result, our dryland (non-irrigated) corn crop yielded far below what was needed to feed the herd for a whole year. Over the last couple of months we have been relying on last Spring's bumper ryegrass baleage crop, dry hay, and cottonhulls in a ration that allowed us to conserve our corn silage. This ration has worked well for us and our herd, but the cows' milking potential isn't as high as it is when they are on a diet that includes quality silage. We're at the point now we believe we have enough corn silage to make it into the summer, so we will be transitioning the cows to a new ration over the next couple of weeks. Speaking of crops, we hope to be putting a lot of seed in the ground during the month of March. We were unable to plant any ryegrass or small grains last Fall due to the drought, and it's about been too wet since the first of the year. We should get a few days of dry weather after today's batch of thunderstorms rolls through, and I hope to begin drilling about 50 acres of late Spring oats on Monday. Our goal for this crop will be to harvest it as baleage in late April or early May. In addition to the oats, I hope to begin planting our silage corn crop the last week of March. We're looking at roughly 110 acres on our "hill" ground this year, and another 40 in our bottomland. Thanks for reading, and y'all have a "dairy" good day!